Jim and I went for a Sunday afternoon drive last weekend, and we happened upon the Jack Daniel’s whiskey distillery in Lynchburg, Tennessee. We figured if they’d let you take pictures, we’d check out the tour. They did! And to top it all off… their 2-hour tour is FREE! 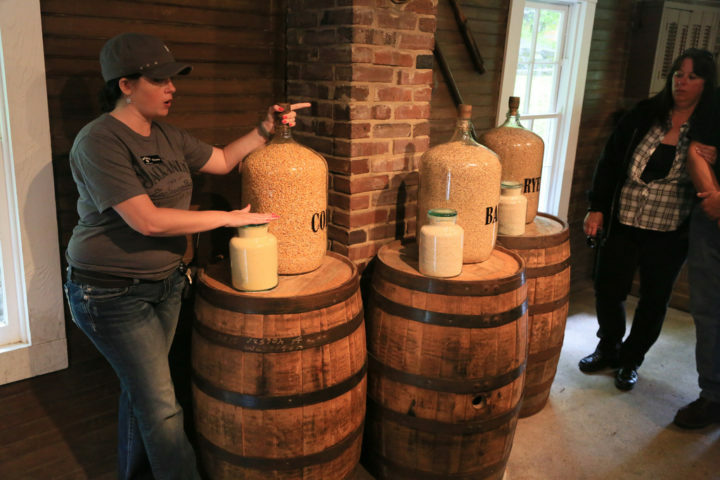 For starters, here are some fun facts about whiskey and how it’s made. You can even take the tour yourself online! Jasper Newton “Jack” Daniel (born in 1850) was one of 13 kids. He was raised by a family friend before being hired out at the age of 7 to work with Dan Call, a Lutheran minister who also owned a whiskey still. Pressured to devote his life to “lifting spirits” rather than “selling” them, Mr. Call sold his whiskey still to 13-year-old Jack. Mr. Jack perfected the “charcoal mellowing” process at the age of 16, and registered his distillery that same year, in 1866. The Jack Daniel Distillery remains the oldest registered distillery in the country. By 1904 (at the age of 54) Jack Daniel’s “Old No. 7” was one of 20 whiskeys from around the world entered in a contest at the World’s Fair. His won the Gold Medal as “the world’s best whiskey”. A year later, Mr. Jack tried to open the safe in his office, but he couldn’t remember the combination, so he kicked it in frustration. It broke his toe, causing infection to set in, and he eventually died (in 1911) from blood poisoning stemming from that mishap. Mr. Jack Daniel never married or had children, but his great-grandniece Lynne Tolley is deeply involved in helping to run the Jack Daniel’s distillery today. She owns Miss Mary Bobo’s Boarding House (where she can often be found cooking the noontime meals), and she is an official taster at her Uncle Jack’s distillery every Friday. *Information adapted from the Jack Daniel’s website, and information obtained from our tour guide, William. UPDATE 9/28/04: Did you hear that Jack Daniel’s just lowered the proof on their classic Old No. 7 sipping whiskey from 86 proof to 80 proof?… You can sign the online petition requesting Jack Daniel’s to raise the proof of Jack Daniel’s Black Label Whiskey back to its original status of 90 proof. UPDATE 6/12/07: Did you hear that Jack Daniel’s cave spring water might be running dry?